Signature and seal of Samuel Brooks. Courtesy Roger Stephen Brooks. [S1461] Jacquelyn Ladd Ricker, The Ricker Compilation, Windsor VR, Samuell Brooks b. [S221] Clarence Almon Torrey, New England Marriages, 103, Samuel Brooks. [S615] Rev. Alonzo B. Chapin, Glastenbury for Two Hundred Years, Appendix 2, 188, "Families residing in Glastenbury when the First Meeting House was Built (1693): with a short genealogical account of the same." [S615] Chapin, Glastenbury for 200 Years, 59, 60. [S641] J. Hammond Trumbull, Memorial History of Hartford County, vol. 2, p. unrecorded. [S2314] Sussanna Brooks probate file. [S2312] Town of Glastonbury, CT, Glastonbury Land Records, Book 3, p. 43, grant to Samuel Brooks. [S2312] Glastonbury Land Records, Book 2, p. 184, Samuel Brooks Senr to Daniel Baccus. [S2312] Glastonbury Land Records, Book 2, p. 185, Samuel Brooks Senr to Samuel Hale. [S2312] Glastonbury Land Records, Book 3, p. 122, Samuel Brooks Senr to Robert Powell. [S2312] Glastonbury Land Records, Book 4, p. 121, Dorotheus Treat to Samuel Brooks. [S2312] Glastonbury Land Records, Book 4, p. 194, Samuel Brooks Senr. to Timothy Brooks. [S1461] Ricker Compilation, Simsbury VR, Thomas Brooks b. [S1461] Ricker Compilation, Glastonbury VR, Sarah Brooks b. [S1461] Ricker Compilation, Glastonbury VR, John Brooks b. [S1461] Ricker Compilation, Glastonbury VR, Samuel Brooks b. [S1461] Ricker Compilation, Glastonbury VR, Mary Brooks b. [S1461] Ricker Compilation, Glastonbury VR, Timothy Brooks b. [S1461] Ricker Compilation, Glastonbury VR, Abigail Brooks b. [S1461] Ricker Compilation, Glastonbury VR, Ledda Brooks b. [S1461] Ricker Compilation, Glastonbury VR, Hannah Brooks b. [S1461] Ricker Compilation, Glastonbury VR, Elizabeth Brooks b.
Findagrave.com, memorial #53967656. Photo by Garry Boice. [S1291] Kitty Ann (last name withheld by request. [S339] Clement and Newton, Hist. Marlborough VT, p. unrecorded. [S366] Patricia Law Hatcher, Abstracts of Graves of Revolutionary Patriots, vol. 1. 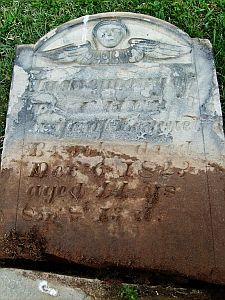 [S148] FindAGrave.com, memorials #47026489, #53967656. [S2054] J.H. Beers & Co., Counties of Huron and Lorain, 60-62, Irving J. Brooks. [S1530] Shirley Lindenberger Hazelwood, 15 Jun 2007. [S1461] Jacquelyn Ladd Ricker, The Ricker Compilation, Enfield VR, Hestor Kibbe b. [S1461] Ricker Compilation, Enfield VR, William Brooks/Esther Kibbe m.
[S2055] Francis Olcott Allen, The History of Enfield, Connecticut, Volume II, 1757, Intentions of Marriage, William Brooks/Esther Kibbe; 1770, m.
[S1461] Ricker Compilation, Enfield Street Cemetery, William Brooks g.s. [S2055] Francis Olcott Allen, Hist. Enfield, CT, II, 1269, Select Men's Account. [S1461] Ricker Compilation, Enfield VR, Esther Brooks b. [S2055] Francis Olcott Allen, Hist. Enfield, CT, II, 1616, Public Documents, Esther Brooks b. [S1461] Ricker Compilation, Enfield VR, Mary Brooks b. [S2055] Francis Olcott Allen, Hist. Enfield, CT, II, 1619, Town Records, Mary Brooks b. [S1461] Ricker Compilation, Enfield VR, William Brooks b. [S2055] Francis Olcott Allen, Hist. Enfield, CT, II, 1638, Public Documents, William Brooks b. [S1461] Ricker Compilation, Enfield VR, Zerah Brooks b. [S2055] Francis Olcott Allen, Hist. Enfield, CT, II, 1638, Public Documents, Zerah Brooks b. [S1461] Ricker Compilation, Enfield VR, Love Brooks b.; d.
[S2055] Francis Olcott Allen, Hist. Enfield, CT, II, 1638, Public Documents, Love Brooks b.; 1867, Deaths, d.
[S2055] Francis Olcott Allen, Hist. Enfield, CT, II, 1638, Public Documents, Esther Brooks b. [S1461] Ricker Compilation, Enfield VR, Lemuel Brooks b.; d.
[S2055] Francis Olcott Allen, Hist. Enfield, CT, II, 1638, Public Documents, Lemuel Brooks b. [S1461] Ricker Compilation, Enfield VR, Lemuel Brooks b.